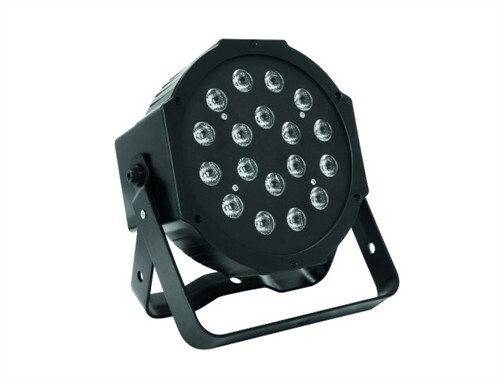 Equipped with 18 x 1 W LED: 6 x red, 6 x green, 6 x blue. Flat housing form requires minimal space when rigging. Second mounting bracket for safe standing installation. Additional rubber feet when the spot shall be positioned on the floor without mounting bracket. Comfortable addressing and setting via control panel with LED display. Functions: Static colors, three different color changes (2 x FC*, 1 x SC+) with adjustable speed, RGB color mixture, strobe effect, dimmer, sound-control * FC = Fading Colors: uninterruptedly gradually fades out colors in a given period of time. + SC = Switching Colors: uninterruptedly switches color in a given period of time. Operable in stand-alone mode or via DMX. Memory function. Master/Slave for parallel operation of several devices. Switch-mode power supply for operation between 100 and 240 Volts. DMX512 control via regular DMX-controller. Sound-control via built-in microphone. Power cord included in delivery.